CDW-G just released its third annual 2011 Unified Communications Tracking Poll, which found that the percentage of organizations that have fully implemented unified communications (UC) has at least doubled in the last year, growing from 4 percent to 17 percent in higher education and from 13 percent to 19 percent in K-12. Interestingly, cloud computing is helping drive the move to UC with 67 percent of higher education institutions and 71 percent of K-12 districts reporting that they are evaluating, deploying or have fully developed UC using a cloud model. The percentage of higher education institutions that have fully implemented UC more than quadrupled in the last year, from just 4 percent in 2010 to 17 percent this year. 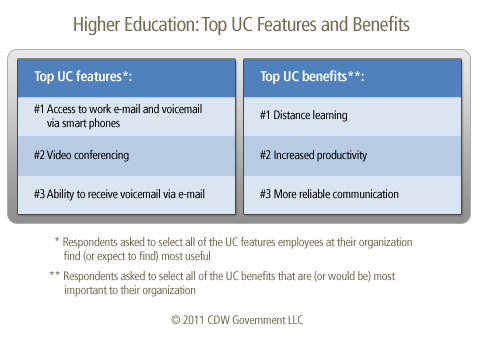 Asked to identify the top features and benefits of UC, higher education IT professionals cite better increased flexibility and access to e-mail and voicemail and better opportunities to deliver education. As in higher education, UC adoption in K-12 districts also grew in 2011. In K-12, UC improves teacher productivity and enhances mass notification programs, both vital elements of districts’ technology plans. 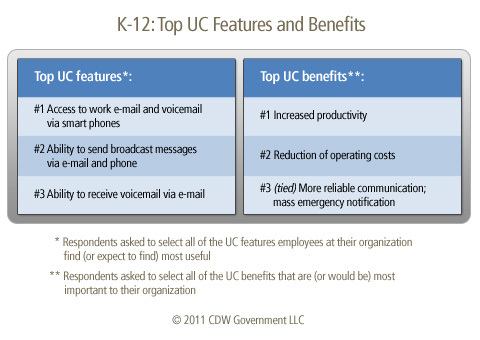 For education institutions considering UC, CDW-G notes that UC is more than just “voice mail in your e-mail” as it can change the way organizations collaborate and operate. It is also important that IT professionals consider the UC experience for internal and external customer by studying a group and understanding how they collaborate. This step will help the organization understand the experience that users will expect from a UC solution. When it comes to the implementation, CDW-G encourages organizations to deploy a solution that is flexible and will adapt as new technologies come to market. Also consider all the different ways that users communicate – voice, social media, Web or video – so that they communicate with you in the way that they are most comfortable. Finally, embrace mobility, which is the top feature for both higher education and K-12, by deploying UC applications that work securely on multiple platforms and devices. Anyone out there have examples of how districts are implementing UT?